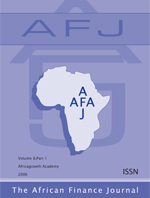 The African Finance Journal (AFJ) is published twice a year and edited at Africagrowth Institute. The Journal is jointly published by the Institute and the African Finance Association. AFJ publishes significant new research in finance, accounting and economics relevant to Africa and strives to establish a balance between theoretical and empirical studies. The principal criteria for inclusion are a paper's quality and contribution to the field of Finance, Accounting and Economics without undue regard to its technical content. The Journal’s target group include academics, research institutions, governments, students and other policy makers. All articles published in AFJ are blind-peer-reviewed by two anonymous referees. The AFJ is listed in Econlit, Repec, Scopus and IBSS. The journal is accredited by the South African National Department of Education for the purpose of research subsidy.